iPad Enclosure Box: Made up of MS sheet metal with dimensions, the box has the necessary cutout for charging & speakers. Home button options are available. Padding is provided inside the box that provides support & saves the iPad from damages. The box is equipped with a tamper resistant locking system. The base stand is made of MS with a compatible mount at the top & a thick metal plate at the bottom which can be bolted to the floor/ground. Colour options powder coating gives the product a very fine and classy looks. Size Tablet sizes 7-9.7" & 10.1" to 12.9"
We customise & manufacture POS solution that utilises the security, mobility, and engagement level of tablets for every major business application Off-line Ordering, Kiosk, Digital Catalogue, Visitor Attendance system. Mounted on base, the iPad table mount creates an interactive experience perfect for simple POS systems, digital loyalty/rewards, interactive digital signage, etc. 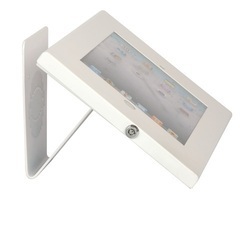 As a combined iPad stand and iPad enclosure, the Kiosk provides an affordable and durable design. Works with multiple iPad POS dongles. Complete your home, business, or public display with this easy-to-use locking iPad Tablet wall mount. Built for long term, frequent, and safe use, this wall mount will improve your tablet usage for years to come. The large case size is adaptable for multiple types of tablets and styles so if you upgrade or need to replace, it will still be compatible. The most important feature is attributed to the security and safety of your tablet. Trust in our holder with the lock and key security measure. You will never need to worry about a theft. The easy to use and safe design is coupled with its sturdy and elegant construction. Made from high-strength steel, you can be certain this stand wont break or fall apart on you. The black color scheme and cable holes keep the slim profile looking modern and aesthetically appealing. Safely and securely place your iPad on display. The Pyle iPad anti-theft wall mount Stand can be installed on any wall or flat surface. Rugged and durable steel construction provides device security where needed. Allow Convenient access to your iPad when installed in high traffic areas like in an office, lobby, front desk, customer counter or showroom floor. Choose between landscape and portrait iPad orientation to fit any displaying need. You can also use the included accessory Tab to either allow or block access to the home button. The anti-theft iPad Stand comes with all the necessary mounting hardware and brackets to grant safe and Secure access to your device -- all while adding a professional and clean look. The iPad POS Floor Stand, for iPad Pro, iPadAir, iPad & iPad mini will provide you with an enclosed Point Of Sale KIOSK or tamper resistant display, while allowing access to controls and ports, on a heavy metal stand. It has been designed for perfect position from cashier to customer or for display purposes. While great for point of sale, the enclosure is also perfect for general display purposes like restaurants, museums, trade shows exhibition and other events. Allows "protected" access to all perimeter ports and controls. If there is anything you would like customized or changed we are here to work with you, no order is to small. Please call us with your request. Proudly made in INDIA by machining the metals. Full access to controls and ports (including home, lightning and audio ports) at no extra charge. Optionally, no access or limited access (pen tip) to home button available. Full camera(s) view access, no extra charge - Optionally, no access to camera port(s) available. Color: White, Black, Red & Blue face plates available. Assembled in 3 pcs for easy shippments. Looking for POS Kiosk iPad Floor Stand ?